It seems like new, innovative technologies to reduce our carbon footprint are always 10 years away. It’s hard to imagine there won’t be another amazing technology just around the corner. 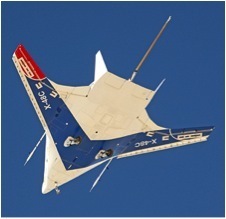 In this case, NASA has developed a manufacturing method for wing-shaped aircraft. When combined with an uber-efficient jet engine called an “ultra-high bypass ratio engine”, this new design promises to cut fuel consumptions by half. Scientists have long known the benefits of a wing-shaped aircraft compared to the conventional tube and wing design of virtually all existing aircrafts. The flying wing design hit mainstream awareness with the B2 Stealth Bomber although the patent for a “tailless plane” was filed in 1910 by Hugo Junkers. The benefits of such a design are namely reduced structural material resulting in significantly lower overall aircraft weight, and more lift generated by more dramatic wing surface and curvature. The challenge of such a design thus far has been aircraft control during lower speeds. In addition, the flatter design has proven to be more challenging to support a pressurized cabin. Conventional tubular designs are easier to manufacture to support extreme temperature differences. “NASA’s manufacturing process starts with preformed carbon composite rods. The rods are covered with carbon fiber fabric and stitched into place. Fabric is then stitched over foam strips to create cross members. The fabric is impregnated with an epoxy to create a rigid composite structure.” Tech Review. In addition to strength and reduced weight, the carbon fiber stitching process appears to prevent more catastrophic events in flight. When pressured to the degree of breakage, the stitching prevented cracks from spreading. With recent failures in the most expensive aircraft ever built, the Boeing 787 “Dreamliner”, a safer design will be welcomed by consumers. That being said, this new design is a result of a $300 million partnership between NASA, Pratt & Whitney and Boeing. Providing Boeing doesn’t convince the powers that be to include a lithium ion battery in the design, everything should work out. The new engine design (pdf), developed in 2010, will be used in the first commercial manufacturing process next year. It promises to dramatically reduce CO2, NOx emission and manufacture cost. 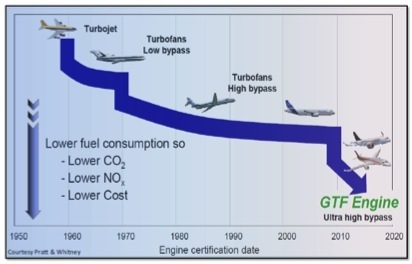 If not in the entire flying wing package, the ultra-high bypass ratio engine promises to change transportation emissions significantly as it makes its way into the commercial airline fleet. More to come on this engine later.